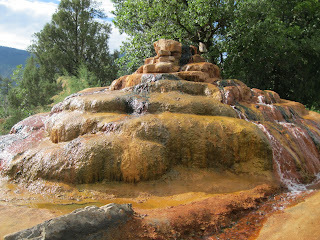 On the road north of Durango, Colorado there is a hot spring that bubbles out of the top of a pile of rocks right on the shoulder of highway 550. The minerals have formed a smooth rounded rock formation that is pretty cool. A lot of tourists stop and take pictures of it, and some climb on it. As did I. And I discovered it isn't quite what it seems. I had noticed that some of the rocks near the top seemed too angular to be the result of mineral deposition. Then when I climbed to the top I saw that the water was coming out of a metal pipe that poked out of the middle of the top rock. I tasted the water, and it was warm, not hot, and tasted like soda. Not horrible, but I wouldn't be craving this water if I were thirsty. I suppose the story is that there was a hot spring beside the road, and someone decided to make it more interesting by sinking a pipe and piling rocks so that the water could cascade down rather than just pool. And it worked well. Time has made it even better by growing a nice deposit of minerals that makes it look more natural and like something you might see at Yellowstone. What got me was how many tourists stopped while I was there and, instead of checking out anything for themselves, stood there taking pictures and asking me about it. They asked how hot the water was. They asked what the water tasted like (when I mentioned tasting it). And I told them about the pipe. Not one then checked on what I had told them. Where is the scientific method in these people? Is this why people just accept the lies that are told them about how necessary The State is? Am I that different in my willingness to check things out for myself rather than just asking some random guy standing around? With such a period, it certainly shows the power of mineralized water to create-and in a short time. There is a possibility that the base is a natural formation, and the pipe was added to keep the spring from finding a new path and leaving the formation dry. I believe I once read that that happens occasionally with chimneys like that, the water finds an easier course when the chimney reaches a certain height, leaving the formation dry. Seems like something that would have been "fixed" with a 1950's attitude(no doubt by the government). This too could be determined definitively, I'd imagine. I don't know why people are not more inquisitive-perhaps because it requires effort, and it's much easier to take some guys word to ease curiosity and move on? It is too bad. It looks slippery as hell. I, too, would have asked you, to avoid risking wet clothing or broken bones. Surprisingly, it wasn't slippery. I also checked for that before I climbed on it. There are several big ones like this in Thermopolis, which bills it as the world's largest hot springs. However there is some dispute with another in New Zealand about that. Thermopolis is a good place to visit with your swim suit on a cold day.